Who is the Singer Start For? Singer has been in the sewing machine game for a long time, and they know how to make high-quality appliances. The Singer Start 1304 Full Disclosure: We earn a commission if you click this link and make a purchase, at no additional cost to you. sewing machine is no different. It may be aimed at beginners, but that does not mean that there is not a lot of power and functionality here. They say that great things come in small packages, and that is certainly true of this sewing machine. From the first look at this machine, you can see that it is simple and easy to use. We were able to pick one up and give it a try. We found a lot to like about it, both in the look and the functionality. Join us as we reveal what we found and decide if this is the right machine for you. We like the look of the Singer Start 1304. Most sewing machines look similar in appearance, but this one has nice smooth and curved lines. The accents of blue and red give it some color and make it pop. Basically, what you see is what you get with this machine. The look also makes it enticing for new users. At a glance, you can see the stitch selection knob and know that you are in for an easy ride. This machine is going to have all you need for your starter projects without overwhelming you with a lot of options. There are 6 built-in stitches with this machine. This may not sound like a lot, and to a more advanced user, it isn’t, but for a beginner, it is the perfect number to start out with. 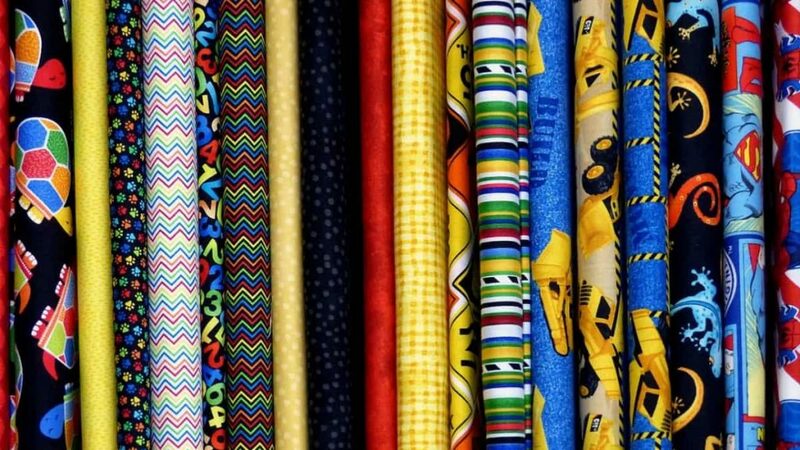 Your stitches include a straight stitch, zigzag, satin, blind hem, scallop, and a 4-step buttonhole. The machine will also stitch at up to 750 stitches per minute which is extremely fast for a beginner’s machine. You may only have 6 in-built stitches with preset length and width, but the presser door variety allows you to mix up your projects and get creative. The included stitches allow you to work on simple and beginner projects but the presser feet open you up to more interesting and creative stitching. The stitches are easy to select with the control knob, and the presser feet are easy to replace by snapping them off and on. Dual spool pins give you the option to create parallel rows of stitches. This is great for adding a second color to your work and opens you up to even more creative projects. We like this additional option for adding more color to seams or simply making your decorative stitches more decorative. An LED lamp will allow you to sew long into the night or in low-light conditions. We like that LEDs last for a long time and do not get as hot as traditional bulbs, so there is no chance of you injuring yourself. We like how easy to use the Singer Start 1304 machine is. When it comes to setup, there is an automatic bobbin winding system, and the instructions for setting up the machine are easy to follow and almost intuitive without having the instructions in front of you. The threading system is also printed on the machine for you to follow. When you have the machine set up, your stitch selection is laid out in front of you on the dial. A simple turn of the dial will select your desired stitch, and you are ready to go. When you buy a beginner machine, you are often locked into only simple projects. This sewing machine opens you up to more creative projects through the dual spools and extra presser feet. We also like the removable free arm. Usually, when you are working on cuffs, collars, and the like, it can be difficult. The removable arm frees you up and gives you more space to work on those trickier projects. For such an affordable machine, especially one aimed at beginners, you would not expect it to be so solid and durable. Singer has used a sturdy metal frame instead of a plastic one. Not only does this mean that the machine will last, but it also means that you get better stitching. A solid core keeps everything in place, so your stitches are going to be straight and consistent every time. We also like how compact and light this machine is. It may have a solid core, but the machine itself is still small and portable. This machine is perfect for keeping in storage until you need it, and the carry handle makes it easy to take with you on the go. The automatic features on this machine seem out of place for such an affordable sewing machine. For instance, the automatic tensioning feature will take care of your thread at all times while the automatic bobbin winder will keep you in thread. The automatic buttonhole feature makes it easy to add professional buttonholes to your work. Three presser feet: all-purpose, buttonhole, and zipper. The Singer Start 1304 Full Disclosure: We earn a commission if you click this link and make a purchase, at no additional cost to you. is a sewing machine which is strictly aimed at beginners. It is also a sewing machine which is easy on the pocket. Beginners and children who have never used a sewing machine will be able to use this machine. 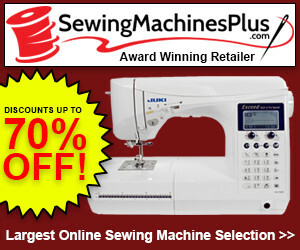 If you own a sewing machine or have used one before and are thinking of buying one, this is not the machine for you. There is limited functionality and definitely a machine for a complete beginner. If you are looking to work on more advanced projects or have a home business, then this would not be a good purchase. The Singer Start 1304 is a beginner machine as the name suggests. If you are a complete beginner, there is no better machine. However, if you are looking for something with a little more functionality, we would recommend the Brother XM2701 Full Disclosure: We earn a commission if you click this link and make a purchase, at no additional cost to you. sewing machine. As you progress with sewing and perhaps move onto quilting, you may want to upgrade your machine with some extra accessories. Until then, Singer has included everything you need to get started on your very first set of projects. The accessories are also conveniently stored in the built-in free arm accessory tray. 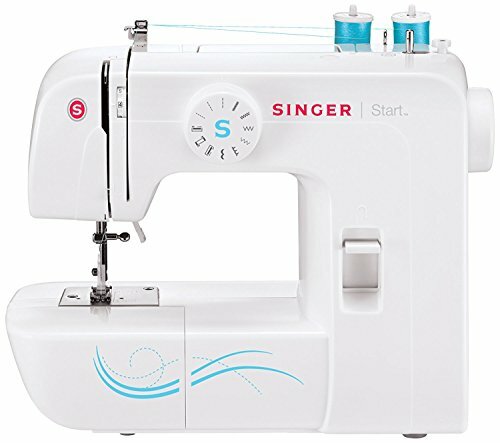 If you are completely new to sewing, we would recommend the Singer Start 1304 Full Disclosure: We earn a commission if you click this link and make a purchase, at no additional cost to you. sewing machine. It is extremely good at what it does and affordable too. In fact, for what you pay, you are getting a lot more features than you would think possible. We like the automated setup and the automated features which come with the machine. The stitch selection is simple, but the additional presser feet and free arm open you up to whole new projects and creativity. A great machine for a novice. The Singer Start 1304 sewing machine came in at #12 in our Best 12 Sewing Machines List. Here’s the full list, including the other 11 sewing machines. The following links will take you to the review of each machine. Singer Start 1304 Full Disclosure: We earn a commission if you click this link and make a purchase, at no additional cost to you.